PRIVATE SHOPPES, LLC, a Birmingham-based direct marketing firm, has developed a specialty in-flight and online catalog exclusively for general aviation passengers. This market, 2.5-3.5 million passengers annually, includes C-Level executives, sports personalities, celebrities, entrepreneurs, diplomats and many thousands of business people who fly 28 million hours a year. 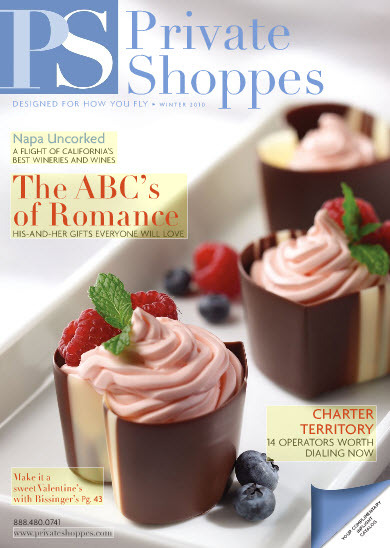 PRIVATE SHOPPES caters to its elusive audience of private flyers by offering top-choice products alongside revealing editorial features on select vineyards, resorts, golf courses and other jet-setter interests in its vanguard catalog and website. Both the catalog and website are uniquely designed to match the discerning tastes of the private flyer with fine products, and to allow readers to shop while on the go. Jet charter operators, in-flight caterers and private air terminals nationwide have teamed up with PRIVATE SHOPPES to distribute the catalog throughout their facilities and onto the private aircraft they operate or serve. Over 1,000 general aviation businesses across the nation are currently receiving the PRIVATE SHOPPES, and several have augmented their shipments to meet demand. The general aviation industry anticipates renewed interest across 2010 as the business jet market continues to recover, and as business aviation flight activity continues to increase over last year. While both business aviation and luxury consumer spending start to make their comebacks, PRIVATE SHOPPES executives are working to serve the rebounding market of private flyers. PRIVATE SHOPPES is the only in-flight shopping catalog and website storefront targeted towards corporate and general aviation flyers. Have anyone purchased from them before?